What do union members get from Labour link? A growing number of left activists in the trade unions are frustrated with the continued financial and political links between the unions and the Labour Party. This is hardly surprising given the attacks on working-class people carried out since Blair's New Labour government was elected in 1997. Privatisation of the NHS and other public services continues at a frightening pace, funding for local government has been cut, welfare benefits have been slashed and public-sector workers have had their pay held down, all to pay for the growing crisis in the capitalist economy. In reality, though, the mood of a layer of activists about the Labour link drags behind that of the union rank and file, most of whom no longer see the Labour Party as a political voice for the working class. This can be seen in the good votes gained for candidates in union elections who call for the link to be broken. But with a few notable exceptions, the union leaderships are reluctant to abandon Labour. Unwilling to face political reality, they exaggerate both the differences between Labour and the Tories and the importance of the 'concessions' they have got from Labour. These concessions are exemplified in the 2004 Warwick Agreement and subsequent agreements. Many clauses in these deals are minimal and some are laughable in the light of events. The commitment to work in Europe "for the introduction of employment protection for temporary and agency workers" rings hollow when you consider the massive pressure on Labour MEPs from Downing Street to oppose the ending of the UK's opt-out from the European Working Time Directive. This has forced many temporary (and permanent) workers to work in excess of 44 hours a week. Equally contradictory is the agreement to "engage in effective dialogue over the future of public-sector pensions". 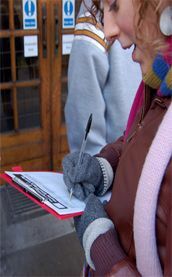 In March 2006, local government workers had to resort to a massive strike in defence of the local government pension scheme. Public-sector union Unison has described the government's agreed protection against a two-tier public sector workforce (due to privatisation) as a lottery, and recently conducted a survey of Unison branches to ascertain just how meaningless it is. Yet many of the union leaders talk vaguely about the need to "reclaim" Labour, with no plan, nor any programme to set about this. In fact, at Labour's last conference the trade unions actually agreed to reduce their voting influence at the conference! Many trade union leaders actually prefer the fact that the power of conference has been replaced by the 'behind the scenes' activity of the Policy Forum, where they can hobnob with ministers and party big-wigs. Labour has lost millions of members, most of them drifting away disillusioned. Its constituency parties are largely dead, engaging in little local activity. Any that still have the temerity to move against right-wing MPs face suspension and/or witch-hunts of activists. For example the Labour Party national executive recently suspended East Lothian constituency Labour Party after it passed a motion of no confidence in its Labour MP, former Unison president Ann Moffat. The trade union leaders are stuck between the devil and the deep blue sea. They know that New Labour is a lost cause for the working class, but they are frightened of the alternative. A new democratic party of the left would draw in precisely the left activists that they fear within their own organisations, those socialists who are being witch-hunted in Unison for example. Knowing how unpopular the link with Labour is, the union leaders often attempt undemocratic, bureaucratic manoeuvres to prevent debate on this issue within their own unions. This is the case in Unison. The Fire Brigades Union pulled out of financing the Labour Party following the Labour government's attitude to its national strike, the RMT was expelled from Labour for supporting the Scottish Socialist Party, and the PCS has recently set up a political fund on the basis that it will not be used to support Labour. What is now needed to boost the campaign for a genuine, left political voice outside Labour is for unions such as these to call together trade union and community activists, and others on the left. They should discuss the current political situation with a view to establishing a broad anti-cuts, pro-public service platform to start to mount electoral challenges to Labour from the left. Such a move would serve as a pole of attraction to shop stewards and other union activists, renewing the campaigns within the unions to withdraw support from Labour. The Campaign for a New Workers' Party (CNWP) was launched by socialists, trade unionists, community campaigners and young people who had had enough of the establishment parties and wanted to fight for a working-class political voice. It is pushing for Labour Party affiliated unions to break the link with the Labour Party and is popularising the idea of a new, independent mass party for working people. A new mass workers' party would play an important role in linking up many different struggles taking place across the country and giving more working people the confidence to fight back.